Frugal and Thankful: They are here!! I had a a pretty rough night last Tuesday with lots of contractions and back pain. I was up half of the night but they eventually stopped. On Wednesday I had my regular doctor's appointment and she said that I was 4 cm dilated. I was only 35 weeks and 4 days, so I was really hopeful that nothing would happen for at least another week but the babies had other plans. At 2 in the morning I woke up to go to the bathroom and on the way back to bed felt like I peed myself (yeah, lots of fun :) I brushed it off but as I was laying down, I felt it again. That's when I completely woke up! I knew that was it, and the immediate contractions that followed left no doubt either. By the time we got to the hospital at around 3, they were pretty steady at 3 minutes apart and quite painful. But I was only dilated to 5 cm. Since a delivery with twins is always risky, they do it in the operating room. It often happens that mom-to-be ends up getting an emergency c-section. They also give you an epidural right away for the same reason. So I got my dose of stuff and was enjoying myself there until about 7 in the morning when the nurse came to check on me and was surprised to see that I was fully dilated and ready to push. She quickly called my doctor and they wheeled me to the OR right away. Both of the babies were head down but we knew that our little girl was a little lower and would come out first. She was born at 7:23 on Friday 11/14/14. We named her Tanya after my Mom. She was measuring 5'7 and 18 in tall (my smallest baby ever!) Her brother Alex soon followed. He was born at 7:47 am measuring 6'7 and 19 in tall. Both were born crying and pink, so no NICU for us. They are absolutely perfect! Teeny-tiny but cute, healthy and we are in love! They passed every single test while in the hospital with flying colors. I, on the other hand, had a few issues. I was shaking like crazy for about two hours after the delivery (more than likely, epidural withdrawal). I couldn't even hold them at first. Then my blood pressure spiked last night and I got an infection so they kept us there for another day to monitor. They eventually put me on medication. Congratulations! They are adorable, and it is such a blessing that they are healthy. Best wishes and we will keep praying for you and your family! Congrats!!! Your babies have the same birthday as my little guy. We just celebrated his first birthday last week. They are just beautiful, Lena! Congratulations to the entire family and wishing you all abundant joy and a few peaceful nights! Oh Lena, they are so sweet! Congratulations to you and your family. What a wonderful birth! Can't wait to watch them grow. Congratulations on your beautiful babies! I have follwed your blog for a while...you remind me of my family...my Gramma and Grampa were from Ukraine. They are gone now...but I have my memories. Congratulations Lena. They are beautiful! Keep well. Congratulations! I am also a mom to 4, with my 3rd pregnancy being twins. Enjoy but be good to yourself and rest! they are beautiful and I am so happy for you. Congratulations!!!!! Glad to hear all is well and that you and the peanuts are doing well. Such precious blessings from our heavenly Father! Hope dad and big brothers are taking it all in stride too. The good news we've all been waiting for...Congratulations! For twins to bake that long and be delivered vaginally...that's fantastic! Congratulations! Beautiful babies! Congratulations! Can't wait to see more pics. They are beautiful. So glad you are all home. CONGRATULATIONS to you, hubby & the boys! What a blessing! They are absolutely adorable!! Looking forward to more pictures - but we can wait - take care of yourself & those babes! OH they are just beautiful! I have an Alex too :) Congratulation Lena! Wow! congrats! Your babies are beautiful! You did a great job delivering too! I hope you feel better each day. Oh my how lovely!!! So happy for you, that's the most perfect holiday gift any girl could hope for. Congrats. They are so precious!! Oh my gosh how beautiful! Congrats! Blessed Twice! Congratulations! They are adorable. I hope you are feeling yourself again soon. At least no c-section, PTL. They are both absolutely beautiful! What a blessing! Congratulations!! awww they are beautiful!! Congratulations!! Oh I am so going shopping, I need an address, what do you need, want? I am so excited. Being a twin I know how special these two are. My sister loves your blog so I am sure she will send something also. take care of yourself girlie! They are so cute! i just want to squeeze them. Oh my gosh Lena! They are beautiful!! CONGRATS!!!!! Congratulations to you all. The babies are beautiful and beautiful names too. Praise the Lord!!! Congrats to you and the entire family. They are beautiful!!!!!!!! Oh Lena how absolutely wonderful!!! 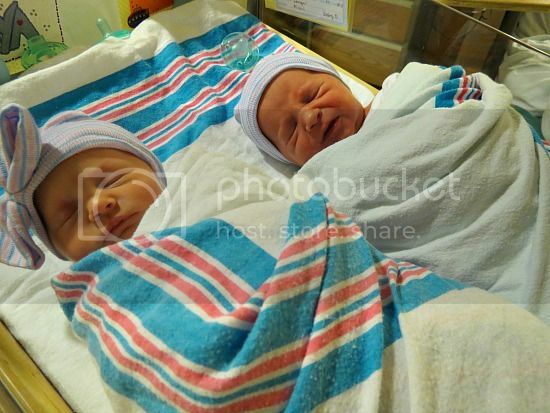 Welcome to the world Tanya and Alex!! Kudos to you my lovely :) for getting through this in one piece!! You did a great job mom! (I'm getting all teary!) They are GORGEOUS!! Ooh, they are perfect! congratulations! What do the big brothers have to say? Congratulations to your whole family Lena! They're perfect! Congrats. They are beautiful. I'm so glad everyone is healthy and doing well.